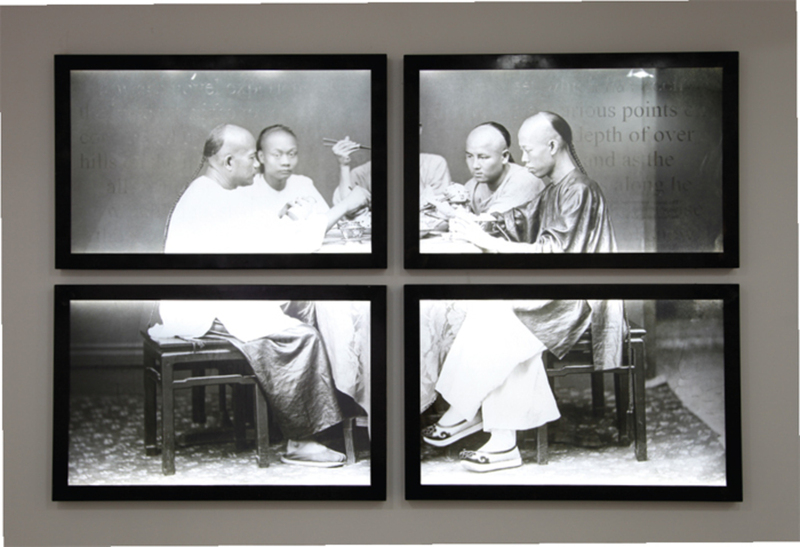 Leung Chi Wo, Bright Light Has Much the Same Effect as Ice (detail), 2012, albumen prints, engraved Plexiglas, LED light boxes, steel frames, each 32 x 49 1/4 x 2 3/8", one element of a mixed-media installation. What do you see when you look at images from the past? This question hovers over Bright Light Has Much the Same Effect as Ice, a body of work produced as a single installation by Leung Chi Wo for the 2012 Guangzhou Triennial in Hong Kong. The project was based on a news item published in the China Mail on January 18, 1893, the day after Hong Kong experienced its coldest day on record at zero degrees Celsius. A quote from this report“Mr. Pun Lun, the well-known photographer, took a number of views in the Peak district during the two days that ‘Jack Frost’ was reigning supreme”printed on white paper and box-framed, comprised one individual work. An adjacent box frame featured a Hong Kong carte de visite taken in 1870 (depicting a fleet of ships in Hong Kong’s harbor), with the stamp PUN LUN visable on the back. Order the PRINT EDITION of the September 2013 issue for $17 or the ONLINE EDITION for $5.99.